Legacy Hot Tubs, Pools & Saunas offers award winning quality hot tubs from Caldera Spas, Maax Spas, Vita Spas, Sunrise Spas, Signature Spas & Free Flow Spas. We offer the largest display of hot tubs in the Tampa Bay area with over 25 spas on display and have over 100 spa models for you to choose from. We also offer the best built swim spas in the industry from PowerPool by Maax Spas & xStream by Vita Spas with 6 different models. We also offer service, parts, chemicals, filters, covers and lots of accessories for all brands of hot tubs so give us a call or stop by our showroom to see why we were voted the #1 Hot Tub Dealership in the Tampa Bay area. Manufacturer and distributor of plug and play portable spas and hot tubs. We would like to invite you to stop in and visit one of our great warehouse showrooms, located in Fort Myers and Naples, Florida. We specialize in quality products for your pool area, patio, or lanai to enhance the Florida lifestyle. Our huge product selection, combined with an extremely knowledgeable staff and low warehouse prices has made The Recreational Warehouse the pool, spa, and barbecue grills leader in Southwest Florida. As a Southwest Florida company, locally owned and operated, we sell and service regularly to Lee, Collier, Charlotte, DeSoto, Glades, Hendry, and southern Sarasota Counties. If you live outside this area, we recommend you find a store that can serve you locally. If you are fortunate enough to live within our service area, please visit us soon, enjoy the shopping experience as you browse our full display and demonstration areas, and discover why Recreational Warehouse has been a local industry leader for nearly 20 years! GREAT QUALITY • BIG SELECTION • EXPERT ADVICE • WAREHOUSE PRICES! VISIT US TODAY AND LET THE FUN BEGIN! 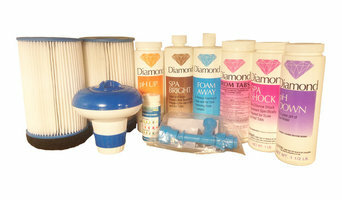 We are the home of the Spa-N-A-Box, Spa2go, Snappy Spa, and all other products manufactured by Comfort Line Products. From New Portable Spas to Replacement Parts, Accessories, Chemicals, Toys, Nautical Decor & Much, Much More, we are your One-Stop Shop for everything you could ever possibly need for your spa. Let us get you in hot water! It’s important that you do some research before visiting a local Rotonda West spa and hot tub dealer. While they can give you lots of information about features and financing, you should have an idea of where you would like to position your spa and what its main function will be. Do you plan to use it mostly for relaxation or socialization? How many people will be using it? All of these things will help the hot tub dealer pick the best models for you. Decide who will be responsible for daily maintenance in your household and if the extra energy costs are something you’re actually willing to incur. Also, know that most hot tub stores in Rotonda West, FL let you do test soaks, also known as a “wet test”, where you can throw on your suit and take each model for a spin in the showroom so you know exactly how they feel before purchasing. Don’t be shy — just think of it as test driving a car! Find spa and hot tub dealers in Rotonda West, FL on Houzz. Narrow your search in the Professionals section of the website to hot tub and spa dealers in Rotonda West, FL. You may also look through photos to find hot tub designs you like, and ask about the details of the spa, including the manufacturer and where it was was purchased.